Are you a Sixties or Seventies child? If so, I would love to hear your personal tale in our history, a time that helped shape our state and our country. Feel free to paint a picture of what life was like for you back then. Please use the comments field below and when it’s approved, your story will appear below. Hi Yvonne. In putting together my own book, I re-found you. Do you remember the Wander Inn? Ed Webby? Me? My husband and I met at Windham College in 1973. It was a great school. We were there at its demise and were sorry to see it end. 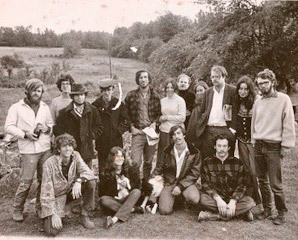 There was a huge folk culture revival around that time and, in Brattleboro, centered on the Chelsea House Folklore Center: British Isles Folk music, contra dancing, Morris dancers. Some wonderful musicians played there and dancing was so popular it had to be moved to larger venues downtown. There were dawn dances that went all night until, well, dawn. Marlboro College hosted an annual Morris Ale, gathering of Morris dancers from all over the east coast.